It’s no secret that this past year has been a whopper for me. During most of my chemotherapy treatments I was able to continue writing and public speaking, but it became increasingly more difficult as time went on. After my mastectomy (and a few ‘hiccups’ along the way) I just needed to hibernate for awhile and take a break from everything – including my garden. While my garden continued just fine without me (though a bit unruly at times) my houseplants weren’t quite as self-sufficient. All except my tillandsias, that is. These little treasures were like the Energizer Bunny – they just kept on going and going, without needing much attention from me. Every time I looked at one of my other houseplants, I’d be filled with a mixture of guilt and resentment, knowing I didn’t have the energy to take proper care of them. My tillandsias, on the other hand, filled me with delight. I knew that if I couldn’t get around to watering them for another week, so be it – they’d be just fine. Even before I became sick, there’s always been something about tillandsias that made my heart sing. Maybe it’s due to their seemingly endless array of colors, shapes and textures. Maybe it’s because of their otherworldly appearance. Or, maybe it’s because they’re one of the easiest ways to transform a ‘blah’ container into something magical. Even just saying the word is fun. Tillandsias (more commonly known as air plants) are in the bromeliad family. Those dried-up looking roots you see at the base of each plant aren’t really roots at all, but rather ‘hooks’ that allow them to grip onto other living things. Contrary to typical plant, their leaves are used to capture nutrients and water from moisture in the air, not their roots. While they won’t ask for much from you, they do have a few requirements. One is that their surrounding temperatures stay above freezing (easy enough to do when growing inside your home). And while they appreciate bright light, you’ll definitely want to keep them out of direct sunlight. Tillandsias will also need a weekly misting of water along with a light dose of liquid fertilizer every few months. In my dry California climate, I take it one step further and give them a really good soaking once every couple of weeks. I just plunge them into a bowl of water and leave them for an hour. After their bath, I drain them upside down in my dish drainer. They really don’t want to have their crowns wet, or they’ll start to rot, so upside down drainage is essential. Oh, and one more reason why they’re such great houseplants is the fact that most varieties will graciously offer you their babies! 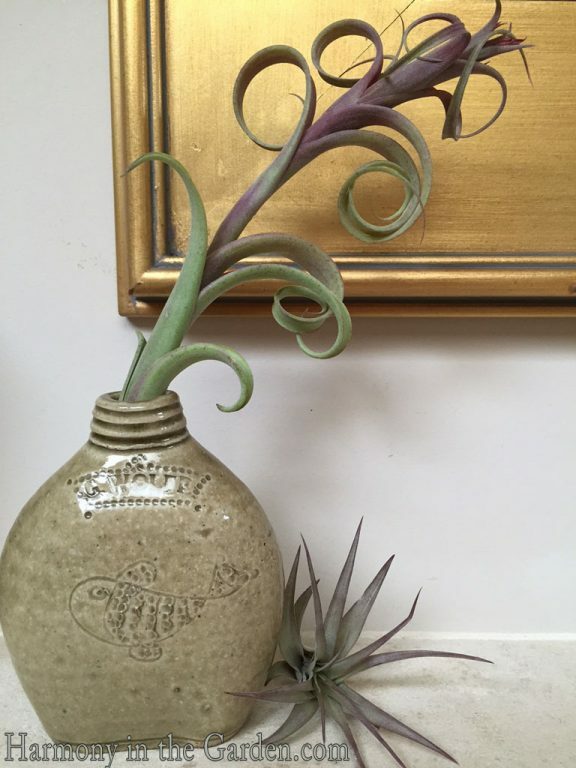 Similar to succulents, air plants will produce offshoots, or pups that you can gently pull off and reuse elsewhere. This tillandsia xerigraphica is one of my all-time favorites. It’s thick and leathery foliage gently swirls around to form a hefty (and satisfying to hold) clump of extra-terrestrial beauty. For most of the year, its primary residence is in this shallow bowl filled with tumbled glass. Many years ago, my husband and I found a pile of old broken bottles in an abandoned dumping ground in the middle of a Lake Tahoe forest. We brought the glass home where it sat in a big bucket in our garage for over 10 years until my husband finally figured out what to do with it. He bought a rock tumbler – and the rest is history. Since lavender colored glass seems more like spring than it does Christmas, I usually end up moving this air plant to a mercury glass bowl once December arrives. I like how the elegant bowl elevates (both literally and metaphorically) this unusual plant. My fireplace mantle is home to these tillandsias. I love how the long, slender shapes of their foliage contrast with the highly-textured containers. It’s a pretty dynamic combination, don’t you think? I bought these containers in Mexico a few years ago and immediately knew what I would do with them. The shop owner must’ve told me a dozen times ‘You know they won’t hold water, right?’ Even though I reassured her that I understood what she was saying, she wasn’t convinced. This grouping of air plants has happily lived in my family room for several years. I found this glass terrarium covered with dust and dirt on an ‘everything must go’ discount table (can you believe it?) and again, immediately knew how I would use it. I wasn’t sure if they’d be okay living enclosed like this, but clearly they are. I use stones in different colors and sizes to help highlight each air plant’s unique qualities. I also bought the other terrarium sitting on that discount table and gave it to my mother. 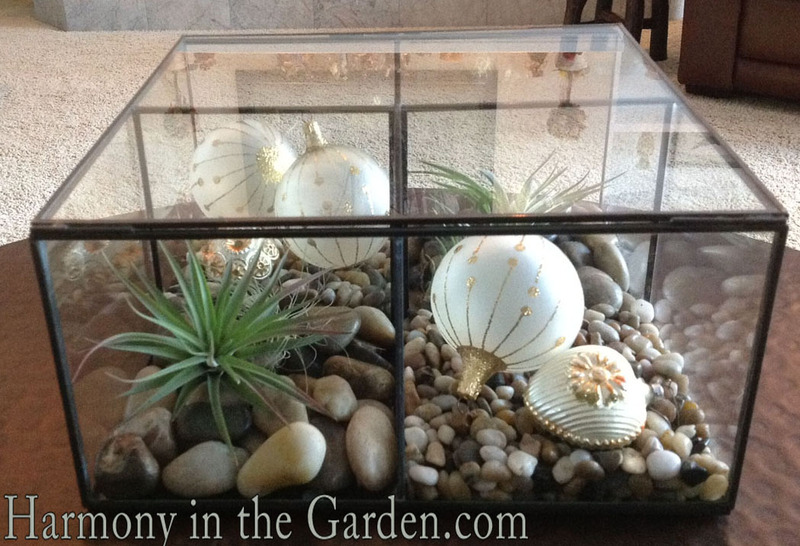 During the holidays, she fills hers with antique Christmas ornaments to accompany her air plants. In my office lives one of my favorite air plants of all – tillandsia tectorum. When I first saw this pricey little gem sitting in the florist shop, I thought it must be fake – flocked with the white stuff that covered our 1960’s Christmas trees. When I was guaranteed that this was, indeed, alive I just had to have it. It’s gorgeous, soft and furry – and part of me can’t help but treat it like a pet! Since it looks a little like something you’d find deep in the ocean, I’ve placed it with my other favorite things to collect – sea shells. Don’t even get me started with my sea shell obsession. While visiting Los Angeles a few summers ago, I visited the amazing garden shop, Potted, and found these sweet little glass containers. After filling them with tiny colorful glass and pebbles, they happily hold more of my tillandsias (and fit perfectly on my old, narrow windowsill). On the next windowsill over are a group of tiny little pottery crocks that I’ve had for decades. I never knew what to do with them until my air plants started having babies. Now they’re an ideal spot to create a tillandsia pyramid. Not the air plant, but the little guy who lives inside of this terrarium. My daughter found him at our local carwash (named – you guessed it – Lozano’s) and lo and behold here he is, watching over me as I do the nightly dishes. I especially love this teardrop terrarium from Lila B. Design, which is one of my favorite floral design/goodies shop ever. I’m particularly fond of the cool base that goes along with the terrarium, allowing it to rest securely on the counter. I like the weary yet determined look on Lozano’s face as he’s discovering new lands…. I hope you’ve enjoyed seeing just how much fun you can have with these little easy-going beauties. 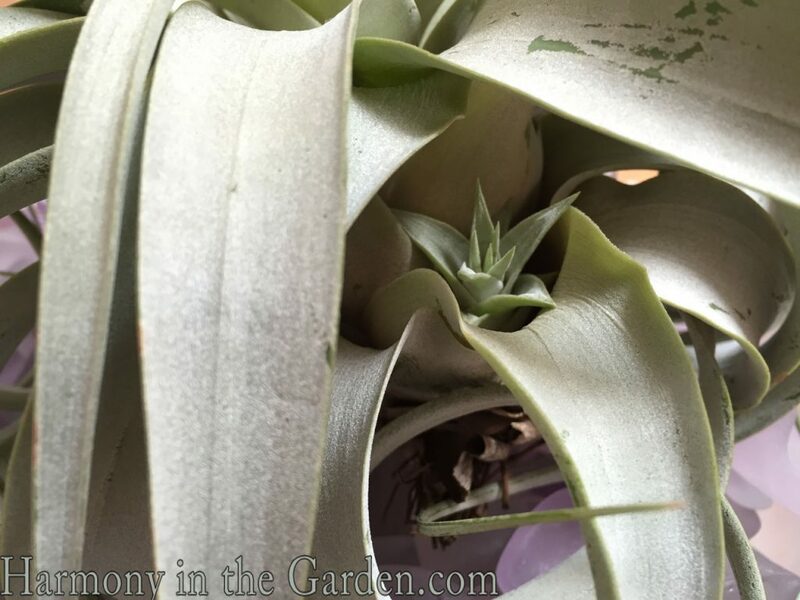 And, if you’re not hooked quite yet, then the giveaway I’m about to offer will surely convince you to give tillandsias a try. Air Plants, written by Zenaida Sengo, is a beautifully photographed book with everything you’ll ever need to know about growing, designing and crafting with tillandsias. I read this book from cover to cover, enjoying learning about how to care for these plants, how to take care of their ‘pups’ and a zillion creative ways to display them in the home. UPDATE: Congratulations Beeg – you won the Air Plant book (I’ve already sent you an email asking for your home address so once I receive it, the calendar will be shipped). Thank you all for your good wishes and for participating! How to enter: For a chance to win, leave a comment here on my blog letting me know either 1) creative ways you’ve used air plants in your home, 2) your favorite varieties, or 3) what you might do with one, even if you’ve never had one before. How easy is that? And even though I can’t respond to giveaway blog comments (if I do, it’ll skew the random number generator), please know that I read every one and love what you have to say! A few more details: A random winner will be chosen by midnight June 22nd and contacted within 24 hours. If the proposed winner forfeits or does not claim the prize by June 28th, the prize will be re-awarded based on the sponsor’s sole discretion. All prizes will be awarded. Please provide your first and last name to enter this contest so I can immediately contact you if you win. The winner agrees to allow his/her first name to be mentioned in conjunction with this giveaway. All material © 2009-2015 by Rebecca Sweet for Gossip in the Garden. Unauthorized reproduction prohibited. I have been concerned about you since you have been ‘underground’ for awhile. Glad you are back but i suspect you learned a lot in this past year. I used to hate succulents and thought them boring. Now I have come to relish trying any new one I can find and making amazing gifts with the pups. Similarly, I have never tried an air plant for the same reason – boring. I now, of course, have to give them a try! Thanks. Love the article and am fond of these cool plants. I recently bought one for my son. The gals selling them had carved out the back of colourful plastic dinosaurs and popped the plant into the back of the Tyrannosaurus Rex. So cute I couldn’t resist. Glad to hear that you’re on the mend after a very tough year Rebecca! It’s so wonderful to read a post from you, I’ve been wondering how you’re doing. ‘Tillandsia’ sounds like some magical kingdom far, far away. Thank you for talking us there. I have a few of these but don’t know the varieties well enough to provide their names. I’ve gotten some pretty blooms from a couple but no babies yet. I love that they take little care and little water, especially with California’s new water restrictions. Rebecca, I so enjoyed your article on air plants. I’m excited to try some at my house…I’ll use the vast collections of seashells I brought up from Charleston as the first home! I do hope you’ll choose me…if the plant has your blessed touch I will have a head start on keeping it alive! Lots of love and ((^-^)) hugs for your health! I think Tillandsia’s would look great perched on a garden hat for a garden tour or as a button flower for an outfit. Thank you for this book offer giveaway. Lifting up healing prayers for you! Rebecca, your writing and pictures are food for the soul- just as our gardens are! You have been on quite a journey and your sharing of it has been an inspiration. I believe I have two tillandsias: one lives on a piece of driftwood and sits happily on a windowsill in a bathroom and the other lives in a large snail shell hanging in my greenhouse window. It produces lovely delicate white flowers and then surprising large balloon-like pods. Perhaps it’s not a tillandsia? Neither had names when purchased. Perhaps the book will tell me! Lovely article and plants…not to mention the containers. But more lovely to hear from you. Keep well. Hi! So glad to see you back and glad to know you are feeling better. I love all your air plants and the wonderful ways you’ve displayed them. I was a winner of the Bamboo Habitat Homes giveaway. I never received them. Can you help facilitate that or should I contact Gardener’s Supply? Thank you for your help. You continue to be in my prayers. I love tillandsias too! I got my first one 2 years ago in a glass orb terrarium and while googling how to keep it alive I saw how many beautiful types there were. I ordered a bunch from Amazon and gave home made terrariums as Christmas presents. Rebecca, I wish you comfort and peace during your cancer journey and I’m sending prayers your way. Your photos are such an inspiration! I especially liked the terrarium with 4 sections. I would give an air plant to my 9yr. old granddaughter for her bedroom. She likes plants but needs one that doesn’t require much attention. She’s a busy 9 yr. old.! So happy to see your email in my inbox this morning. I was given my first tillandsia recently by my daughter and love it. I would like to add more and am inspired by your pictures. Obviously I need that book. Glad to hear that the tillandsias allowed you to continue to enjoy gardening as you’ve been recovering. I’m still trying to master their care. They are supposed to be “easy” to care for, but I have found it challenging to figure out just how often to mist & soak them. The long, dry indoor winters in the chilly Midwest probably don’t help. Just as I see to be figuring out how to keep them happy, the changing indoor environment seems to require new strategies. Thanks for sharing your inspriational story of finding ways to enjoy “gardening’ through challenging times. Wishing you health & happiness in the days ahead! I’ve been thinking of you, am happy to hear you’re feeling better and delighted to get your great email about these cool plants. Your story and photos have inspired me to be on the lookout for them next time I’m at my garden center. My favorite Tillandsias so far is the red one I bought in March that I have not killed. 🙂 I hope to get more soon. I love them! I’ve loved bromeliads, especially tillandsias, for many years. My favorite right now is ‘Tropiflora’ – probably because it’s getting ready to bloom. Many of mine are mounted on either wood or cork and since I live in Florida they hang outside in trees for most of the year. I have never tried to grow these kinds of plants before, but would be extremely eager to try! I think a small variety would be awesome in a mini-garden (or fairy garden). LOTS of small spaces in between other plants that these little guys could live in our house. I have 5 left. I’m not sure which they are. The constant battle with the cats mixed up the name tags. The blooms are very long lasting and dry well. I need to find some cat-proof display options. Cat joke. My favorite Tillandsia is the same furry T. tectorum that you like so much. I have one too and I love it. I have a bunch of these cool plants all sitting in the holes in a great big cluster of barnacles. I keep all of mine just above the kitchen sink, for the humidity. I love the many creative ways you’ve displayed them! I think I would like to make a hanging arrangement. So glad to hear your tillandsias are being cooperative and giving you love. I can’t believe how many you have??? I just posted about mine here http://thefolia.com/2015/06/10/live-a-colorful-life/ but unfortunately I didn’t know to turn them upside down to dry…today they finally fell apart and unfortunately my nest is without any tillansias. I hope to keep the next one not only for a long time now that I know the trick but to also get some babies! Thanks so much for this post and courage to you! I put 5 or 6 into a big seashell planter, I put three little pups scattered here and there on a piece of drift wood, I filled wine and martini glasses with stones and popped them in there and one lives alone. I just love how many different places you can put them because you don’t have to worry about filling up a container with dirt. I really liked how you change up the look for Christmas time — I’ve been thinking about how I will make them more festive looking and you’ve got my brain whirling now. Would love a copy of that book — looks like a great source of information on the subject. I love your photos which have given me many new ideas. I especially like the red plants and enjoy finding unusual shells to display them in. I also found my plants and garden very calming and a source of optimism while being treated for breast cancer. Best wishes to you!